Earn Double Points with Shazam! 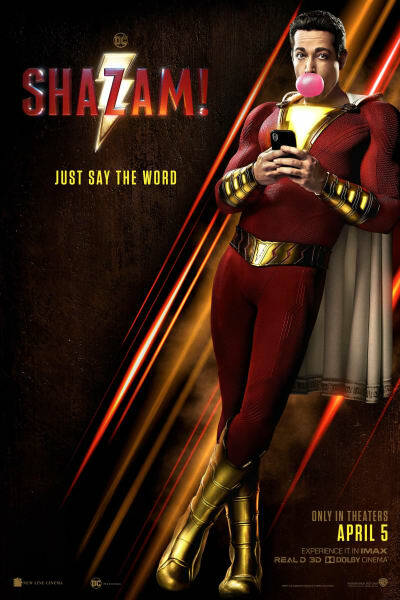 Register now and get tickets to see SHAZAM! 4/4-4/7 to earn double points – just like magic! We all have a superhero inside us, it just takes a bit of magic to bring it out. In Billy Batson's (Angel) case, by shouting out one word--SHAZAM!--this streetwise 14-year-old foster kid can turn into the adult Super Hero Shazam (Levi), courtesy of an ancient wizard. Still a kid at heart--inside a ripped, godlike body--Shazam revels in this adult version of himself by doing what any teen would do with superpowers: have fun with them! Can he fly? Does he have X-ray vision? Can he shoot lightning out of his hands? Can he skip his social studies test? Shazam sets out to test the limits of his abilities with the joyful recklessness of a child. But he'll need to master these powers quickly in order to fight the deadly forces of evil controlled by Dr. Thaddeus Sivana (Strong). © 2019 Warner Bros Ent. All Rights Reserved. TM & © DC Comics Select AMC Stubs members who register for promotion will earn double points on paid ticket purchases to SHAZAM! during the promotion window (4/4-4/7). A qualifying purchase must 1) occur at participating locations, 2) occur during the promotion window, and 3) have the member's AMC Stubs account # associated with the transaction. Double points defined as a 100% bonus on base points earned on paid tickets to SHAZAM!.All Bonus Points will be awarded in 2 to 4 days following the completion of a qualifying visit. Registered members are limited to one qualifying purchase per day of the promotion. AMC associates are not eligible to participate in this Bonus Point promotion.